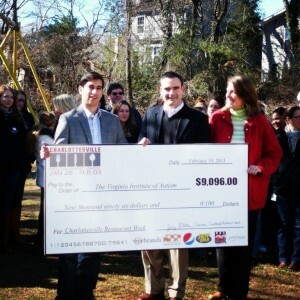 On Monday, February 18, 2013, Charlottesville’s most notable restaurant owners will gather on the playground at the Virginia Institute of Autism school campus to present the school with a check for more than $9,000 and to celebrate the first-ever Charlottesville Restaurant Week organized by local restaurant and business owners. The donation is ear-marked for a new playground for the school. The current playground looks a little worse for wear, but it will soon see better times, thanks in part to Charlottesville Restaurant Week, which was organized by vmv brands, a Charlottesville-based advertising and solutions agency. In total, 28 local restaurants and more than 35 businesses located in Central Virginia participated in the event. The promotion generated more than $500,000 in gross revenue across the City of Charlottesville, Albemarle County and Madison County. With 28 restaurants participating, more than in any previous restaurant week, the event was bound to make a big impact This event, which is not affiliated at all with The Hook’s promotion, transpired over a seven-day period, from Jan. 28 through Feb. 3, a historically slow time of year for local restaurants. To see the restaurants that participated in the event, visit CharlottesvilleRestaurantWeek.com. That’s good for Charlottesville. But what does it all amount to? Ask the staff at the Virginia Institute of Autism. They are hoping that before the end of the year the school will have the chance to build its first playground designed specifically for the students they serve. Charlottesville Restaurant Week and vmv brands just raised 10% of the total cost in just one week! With the support of Charlottesville Restaurant Week and vmv brands, VIA is almost halfway to the goal for the playground project, and is seeking donations to complete the project before the end of the year.